Sharp HT-SL50H review | What Hi-Fi? Sharp’s biggest aim here seems to have been to make the bar itself as slim as possible, and here it’s absolutely succeeded. To keep the size down, though, the company has had to put all the electronics and connections in the subwoofer. Not that there are many of the latter, mind – there’s just one HDMI input and one output, plus speaker terminals. Perhaps more surprising is the lack of a remote control, or even an on/off button – the Sharp relies on HDMI-CEC, now built into almost every TV, in order to turn on or off with your telly and have its volume controlled by your TV’s remote. So in a way the system is very simple (although we did have a bit of trouble getting it to work with our Samsung UE32D5000), but it’s also limited in terms of connections and there are no settings to alter sound quality. That wouldn’t be a problem if sound was any good. The array of small speakers produces a distinctly shouty sound, while the sub rumbles along with all the aimlessness and woolliness of a slow-witted sheep. Voices are quite well projected, but they’re not too clear, and suffer most from the tonal gap in the midrange. 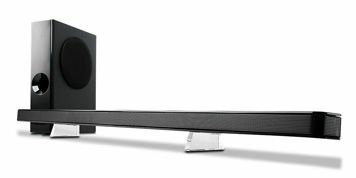 Luckily for the Sharp it does sound better than most TVs, and it’s very affordable, but it still can’t stretch to more than three stars.